31 January 2018, 09:09 a.m.
Worldwide spending on traditional - i.e. non-cloud - IT infrastructure is expected to decline by 2.6 percent in 2017, but will still account for 57.2 percent of total spending on IT infrastructure products -- that's down slightly from 62.4 percent in 2016. 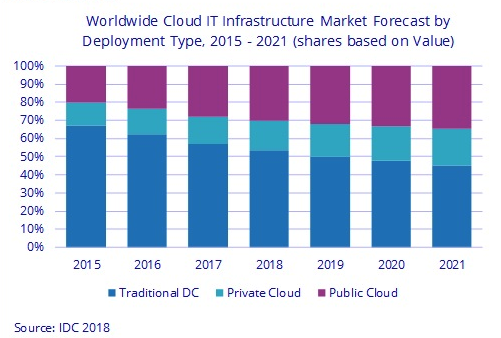 Long-term, IDC expects spending on off-premises cloud IT infrastructure will grow at a five-year compound annual growth rate (CAGR) of 12 percent, reaching $51.9 billion in 2021. 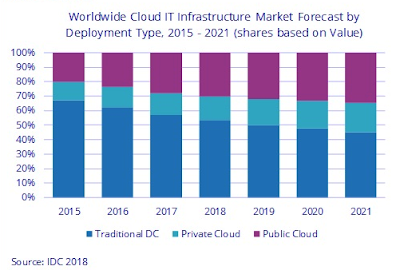 Public cloud data centres will account for 82.1 percent of this amount growing at a 12.1 percent CAGR while spending on off-premises private cloud infrastructure will increase at a CAGR of 11.7 percent. 1 Feb 2018, 4:25 p.m.